Why should I choose Keystone Answering Service? Keystone will help you promote a polished, professional company image – focused on serving your customers – with a full compliment of customized, enhanced call management products and services. How long has Keystone been in business? Since 1972, Keystone has successfully been providing continuous service to a growing client base. With an answering service, you’ll be confident that your calls are being handled by competent, trained, and certified professionals, with a deep understanding of your company’s communication requirements – so you can focus on your business-at-hand. What’s more, you’ll maintain an affordable, competitive advantage, offering 24 / 7 telephone coverage for your clients to reach you. When can I use Keystone? Use Keystone’s telephone answering services 24-hours-a-day, every day of the week. Some of the most popular times for clients to use our services include: after hours, as a day-time receptionist, during lunch hour or company meetings, holidays, and weekends. We can even handle overflow calls when your front desk needs additional support, or when you’re looking for a quiet phone for a few minutes while you work. When can Keystone start answering my calls? Today, if necessary. Pending the specifications your account requires and the information you provide us, our account programmers may be able to get your account up and running in the same day. We recommend and appreciate a 48-hour time frame in order to train our staff. Call forwarding allows an incoming call to be redirected to another telephone number. Here at Keystone, our superior answering system identifies the called number and alerts our agents that your phone is ringing. Your account’s profile then guides the agent on how to handle your call. In fact, over time, our agents become more familiar with your needs and are always alerted to updates. When can I forward my lines to Keystone? Keystone agents are available 24 / 7 to answer your calls. Just forward your lines, let us know who from your company is on-call to receive messages, and provide any special instructions you have for relaying messages. Simple! What if I have multiple offices or locations? Multiple offices or locations are easily accommodated with Keystone Answering Service. Each of your locations is configured with its own account, allowing each office to have an individualized answer phrase and call handling instructions. Please contact us directly to learn more about the best options for your business. Is Keystone qualified to manage my calls? Keystone is 24 / 7 ATSI Site Certified , and our Agents, Dispatchers, and Supervisors are all ATSI certified. 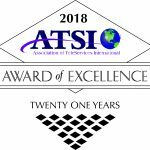 Keystone has won the ATSI Award of Excellence every year since 1998, and the CAM-X Award of Excellence since 2008. We work hard to achieve excellence through certifications and are dedicated to customer satisfaction, which is recognized by our industry awards. We have many emergency calls. How are they handled? Our staff expertly manages emergency calls, lab results, consults, sales leads, web-based customer service applications, and other important communications,in accordance with your detailed instructions. Every call and all subsequent activity is fully documented. We have customized procedures so that each call may be dispatched and responded to immediately by your on-call personnel. How often may I make changes to my instructions, on-call information, staff list or account? Keystone always wants your most recent information. This means you can update your account information whenever you feel the need. Our agents provide the highest level of service when we have access to the most current and correct information available. For convenience, you may change your on call schedules, personnel information and deliver messages through our web portal anytime, anywhere. Our pricing is based upon how much time our agents spend working on your account with your callers and your staff. Keystone will work with you to determine the most cost effective ways to relay messages to you. There are no hidden fees for using the service on the weekends, holidays, or emergencies relating to weather or other unforeseen issues. How does Keystone know about my industry or business? With over 40 years’ experience working with a numerous companies in a variety of industries, we’ve have become very good at what we do. We combine this experience with your company-specific insights to provide unsurpassed service to you and your callers. How does Keystone ensure that my calls are handled correctly and professionally? From Keystone owner Christopher Bell to upper management to our customer service representatives, the entire Keystone Answering service team operates under the ideals that professionalism and quality service are of the utmost importance. In addition to extensive ongoing training, our agents are also ATSI Certified as Agents, Advanced Agents, and Supervisors. Furthermore, to ensure quality and professionalism, Keystone’s Quality Assurance Manager monitors, reviews, and evaluates each agent on random calls every month. All of these efforts combine ensure Keystone maintains operations under high standards. How do my callers know when they’ve reached my company? Once the call is presented to our agent, our system will present your account’s information and a customized answer phrase. The agent will only be working with information that you have provided us. To most callers, our agent will seem to be a member of your own office staff. Receive your messages by e-mail, SMS text message, or through your web portal. You may choose to receive your messages at multiple times throughout the day, and to have them sent to multiple recipients, if necessary. If you prefer, calls can be patched directly to you or to a secure voicemail box. Contact us to learn more about your message dispatch options. How does Keystone Ensure 24/7/365 service? A system wide battery backup provides several levels of protection. Clean power helps ensure a reliable operation while extending the life of electronic equipment. Does Keystone provide nation-wide service? Keystone works with clients and callers across the United States. Though we serve clients on a national scale, your callers feel that that we are local, and a part of your company. References are always available upon your request. Keystone would be glad to provide you with names and contacts of clients for any industry and any size company. Can Keystone provide me with toll-free numbers? Yes. Let us know if your account will require a toll free number during the sign- up process. Are there service contracts with Keystone? Every Keystone Answering Service account is customized to meet your company’s specific needs. Our agreements are month-to-month; we strive each and every month to earn your business. To terminate service, a 30-day notice is required. Please contact us if you have additional questions about Keystone answering services and products.